The SteelSeries 9H Gaming Headset delivers a tournament-grade audio experience, incredible digital features, and best-in-class comfort. The SteelSeries 9H features two Dolby technologies & allows up to 7.1 channels of realistic multi-channel surround sound with its advanced USB soundcard. Dolby Prologic IIx can convert a simple stereo signal into a rich, surround sound experience. In addition, it can convert a true 5.1 signal in a full 7.1 surround experience allowing for multiple listening modes and a more realistic sound. Features both Dolby Headphone and Dolby Prologic IIx for superior surround experience. Includes the swappable cable system for use with PC, Mac, tablets, and phones. Building on the historic SteelSeries audio tradition, a custom-engineered soundscape features a wide dynamic range, which makes it possible for 9H to deliver a balanced and linear tournament-grade advantage. Advanced components like high grade mylar film further perfect the sound with added clarity and no distortion. When the SteelSeries 9H headset is plugged into its advanced USB sound card, it enables an active noise-cancelling, “smart” microphone that allows your team to hear you above whatever is happening in the area around you – appliances, dogs barking, whining spouses, and more. The microphones processor reduces the “noise” and focuses on the sound that is closer to the mic, your voice. 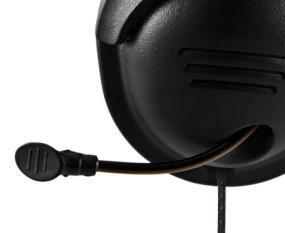 A retractable microphone system allows you to pull it out when you need it or hide it in the left earcup when you don’t. 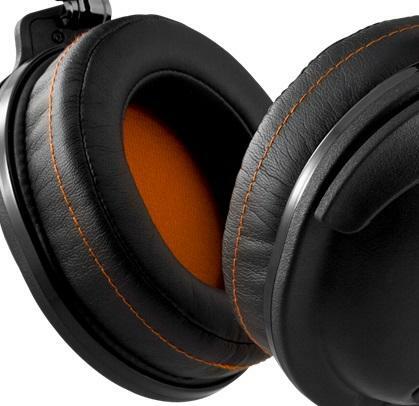 The SteelSeries 9H features double enclosure technology. A second internal enclosure is sealed around the back of the speaker creating a closed design typically only found in high-end audio studio and DJ headphones. When coupled with the extra-padded, leather ear cushions it creates a level of noise isolation unlike any other headset in gaming. Extra-padded, soft all-leather design provides extended comfort and passive noise reduction. The ends of the 9H are swappable so that you can use your headset with PC, Mac, phones, and tablets. A mobile end with a single 3-pole 3.5mm jack and a PC cable with a 3.5mm headphone jack and a 3.5mm microphone jack have both been included. 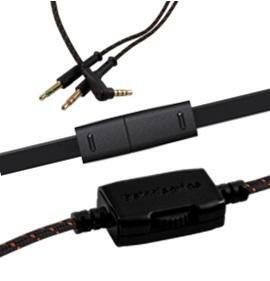 The double braided cable gives the 9H increased durability. An integrated volume controller on the cord offers a microphone mute switch, all for instant control without having to navigate through software settings. Smart noise-canceling microphone can be retracted and hidden in the left ear cup. The SteelSeries 9H Headset offers users the ability to adjust, personalize and save equalizer settings for each of your 8 profiles. Headphones: frequency response: 10-2800 Hz, impedance: 32 Ohm, SPL @ 1kHz, 1Vrms: 110dB, cable length: 3.2m, jacks: 2 x 3.5mm for PC, +4-pole 3.5mm Mac, mobile and tablets. Microphone: frequency response: 50 - 16000 Hz, pick up pattern: uni-directional, sensitivity: -37 +/- 3 dB, impedance: 2K Ohm.